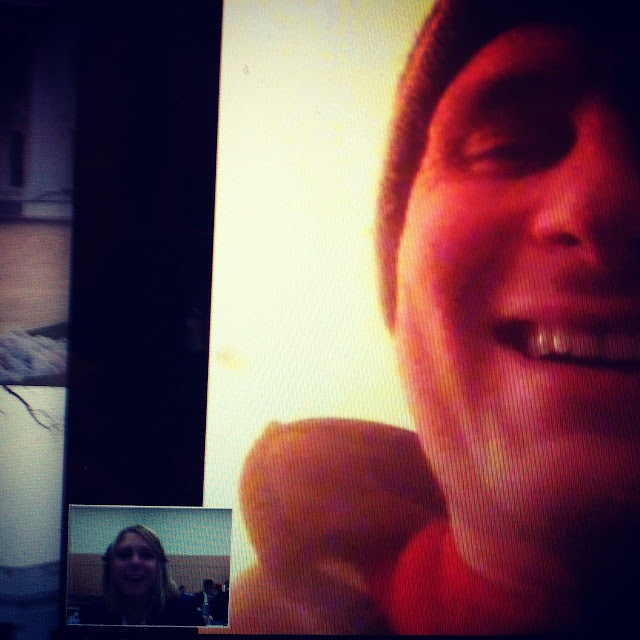 Election night Skype. Skype is great, but I'm glad I get to say good night and good morning every day, in person now. It's pretty much a national holiday. Brokaw woke me up at 5:00am, and I couldn't fall back asleep, so I went ahead and got up, took care of the pets, cleaned the entire apartment, unpacked the suitcase I brought home on, ahem, Wednesday, folded four loads of laundry, and made four lists. Then I saw an arm move in the bedroom. The Birthday Boy was awake! So, we snuggled and talked about General Petraeus and President Obama. Because we are political geek heads. Then, I made crescent roll calzones, at the Birthday Boy's request. He's sitting up in the bed, responding to Birthday messages on Facebook, and taking calls. At some point, I'll get him up, then head to the store. I'm making him meatloaf, mashed potatoes, green beans and a Boston Cream cake. It's going to be 70 degrees in DC today! I'm pretty sure that's God's birthday gift to Michael. This may not sound like a grand birthday celebration, but after two years of tons of travel, I don't think there's anything we'd rather do that just this. Just live our life. Our normal, boring Saturdays are back. Side note: Several people think Michael is a year younger than he actually is today. I have strongly advised him to go with that! Glad you get to be home with him for his birthday and cook his favorite meal. And a 3 day holiday week end too!!! !